Lace applique Queen Anne wedding dress. It is a size 12 with bust 38 while the height is 60 inches from the shoulders. Diamond necklaces are not very much required. Pearl necklaces, on the other hand, seem to be a great match with this dress. 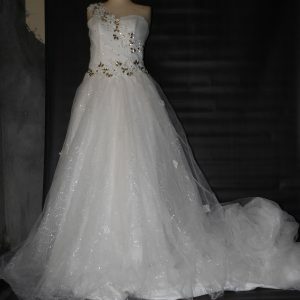 This is because of the flower embroidery on the wedding dress. As for the earrings, the same can apply. A silver color tiara is not required also. We would recommend a great hairpiece made of flowers. The bracelet likewise can have a flower-like design. To summarize this look, flowery designed accessories seem fine. Finally, you can get more wedding dresses in this section and also do not forget to follow us on our Instagram page and all our social platforms. You can sign up for our newsletter which lets you be alerted on new products arrivals and prices related to them. An example is handbags which you would be using after you are done with the wedding. So just sign up since it can save you on some costs in the future.